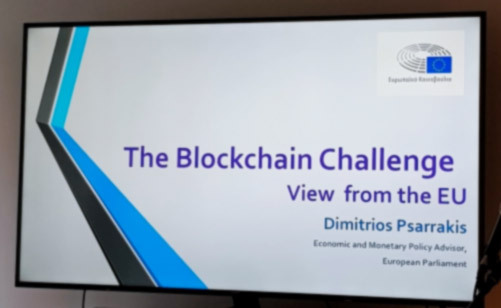 It was my name day on September 20th – a significant day for a Greek Orthodox – but I was by no means going to miss the “Blockchain: Building Trust in Society”event with Dimitrios Psarrakis, a Greek leading specialist in European regulatory policy. This was the first event in PwC Switzerland’s joint thought leadership series with the blockchain hub Trust Square. I was not disappointed; on the contrary, both the speech, the panel discussion with Daniel Gasteiger, Founder, Trust Square & Founder, Procivis, Doris Fiala, Chairwoman, Swiss Control/Parliamentary Oversight Committee & President, Swiss FDP Liberals Women, Guenther Dobrauz, Dimitrios Psarrakis; and the party; were unique. Greeks built the principles of Democracy. Eva Kaili, is the Greek EU parliamentarian that is leading a team with a mission to raise awareness in the European Parliament on the revolutionary potential of Blockchain and how to grab the opportunity to lead in the 4th industrial revolution with relevant and powerful policies. At the opening of his speech, Dimitrios Psarrakis, spoke about their team work in the EU parliament to educate, raise awareness and understanding about blockchain. They slowly but surely managed to obtain nearly 750 votes in the parliament for the Blockchain Resolution, a long and detailed policy for the EU which is based on the principle that Blockchain holds the potential to build Trust in our society in a different and better way, at many levels. Driven by the fact that the internet has been a technological development that has undoubtedly created more convenience and connectivity, but has fallen short in creating more fairness and trust; Blockchain presents an opportunity to build trust and fairness in a very different way. Driven by the belief that Blockchain will restructure several sectors: energy, healthcare, capital markets, Intellectual property etc. ; the EU wants to mobilize capital to fund this revolution – the 4th industrial revolution. The Blockchain Resolution includes several articles and aims to be fully in place in 2019. It has no intention to regulate any instruments – like coins, tokens etc-. It will only regulate the use of them on the newly created platforms. The Blockchain Resolution sees these new digital assets as legitimate instruments and does not attempt to categorize them as securities or commodities. The Blockchain Resolution sees them as alternative investments or contractual arrangements. Therefore, applying the Regulation in the EU for alternative investments, which is fairly flexible, is appropriate. The due diligence process on the platforms should be similar to the due diligence process in crowdfunding. In Europe there is no consensus on the definition of a Security. Europe has MIFID, without a standard definition of a Security. The Blockchain Resolution sees digital assets as alternative investments and the regulatory framework that applies is fairly flexible. Europe, through the Blockchain Resolution, wants to create policies that will mobilize capital to fund the next wave of restructuring the way several markets / sectors function. The view of the EU is to present regulatory principles that are Technology neutral, Business-model neutral, and pro-Innovation. The main principle is to allow for Disintermediation Economics that build Trust.Such economics promise to (a) reduce transaction costs and create new efficiencies, (b) reduce operational frictions by increasing liquidity, (c) automate monitoring processes with limited informational asymmetries (e.g. agency frictions, moral hazard, adverse selection). The Blockchain Resolution is brave enough to look into the promise of Blockchain for Public infrastructure. The view is to restructure (a) traditional public services like land registries, licenses, certificates etc. (b) ways to reduce tax evasion and fraud, (c) cross-border transactions, regulatory reporting, data transactions between European citizens via smart contracts. The Blockchain Resolution just got support from the Strasbourg Plenary. “Blockchain has united this House, as all the parties in the Committee on Industry, Research and Energy (ITRE) voted in favor of the resolution under the principle of being technology neutral and innovation-friendly in Europe.” “One of the core messages of our text was to signify that the European Union aspires to become the global leader in the fourth industrial revolution,” said Eva Kaili. The European Commission will be next in November at the European Parliament Blockchain event. This will be followed by the Blockchain and international Trade Report. In December, the Crowdfunding Regulation will be updated. For the Commission and ECB to identify dangers for the public and incorporate cryptocurrencies into the European payment system. We live a world in which Trust is lacking, Trust is being re-defined, Trust has to be re-built. Are robo-advisors about Low-cost products or `Passive beats Active`? Robo-advisors: What are the fact and figures telling us? Subscribe for our news updates and exclusive content.